The events unfolding in Venezuela since 22 January 2019 cannot be properly understood without considering two points: on the one hand, the interstate relations of Latin America and the US after World War II; and on the other, the recent tension emerging from the unavoidable rise of multipolarity and the ‘counter-reformation’, determined to maintain the unipolar world order that emerged in the 16th century and was consolidated after the Industrial Revolution. I will elucidate these two points in the second and third sections. The basic ‘facts’ that erupted from Venezuela last week have been profusely reported in mainstream media, independent media, and blogs. The ‘meanings’ that surround factual reporting are laid out in two extreme and irreconcilable narratives. Let’s remember the known facts and then try to make sense of them beyond the daily events. US Vice President Mike Pence released a video message on 22 January 2019 in support of the Venezuelan protesters and calling leader Nicolás Maduro a dictator who had never won a free and fair election. On 23 January 2019, President Maduro responded to Vice President Pence: “This is one more US-backed coup attempt against a progressive Latin American government, following Venezuela (2002), Haiti (2004, and every following election), Bolivia (2008), Honduras (2009), Ecuador (2010, 2015), Paraguay (2012), Nicaragua (2018)”. In the early afternoon that same day, Juan Guaidó (who pursued graduate studies at George Washington University in Washington, DC) and was recently elected President of the National Assembly, was proclaimed ‘Acting President of the Bolivarian Republic of Venezuela’. Support from the US, Canada, and several Latin American countries quickly followed. The unfree and unfair reelection of President Maduro was thus followed by an unconstitutional act of presidential self-proclamation. The fact that the reelection of President Maduro was not a fair contest is also recognised by the Left. The unconstitutional act of Guaidó’s self-nomination as ‘Acting President’, as well as the illegal meddling of the US in a sovereign country could be legitimately questioned under Liberal political principles. Later in the day on 23 January, US National Security Adviser John Bolton explained to reporters that the US government decided to intervene in a country that is considered to be posing a limited threat to US interests: “The fact is Venezuela is in our hemisphere”, Bolton said. The Western Hemisphere has been managed by the US since the Monroe Doctrine was implemented in 1823. On his part, US Senator Marco Rubio tweeted four reasons for the US intervention. One of the reasons was that “Maduro has asked #Putin to put naval & air base[s] in our hemisphere”. Cuba and Bolivia supported Nicolás Maduro. Internationally, Maduro had the support of Russia, Turkey, and China. Mexico, Uruguay, Iran, and initially the European Union opted for a neutral position and called for necessary dialogue among the contenders. However, by 26 January, the EU was reported as leaning towards recognition of Juan Guaidó’s Interim Presidency. It is uncertain yet though, if the EU, or some countries of the Union, are changing their initial position. Last but not least, a factor that has not been emphasised are the economic reasons for the political conflict. It is not democracy or authoritarianism but oil that is at stake for both the economic elites in Venezuela and for the US support of the opposition. It was oil that sustained Hugo Chávez’s welfare state and strengthened his international political clout. In this regard, the post-Chávez conflict in Venezuela cannot be detached from the situations in the Middle East – in Iraq, Libya, and Syria. On 26 January, it was reported by OAN/Reuters that ‘the United States is seeking to ensure that Venezuelan oil revenue goes to opposition leader and self-declared interim president Juan Guaidó, and to cut off money from increasingly isolated President Nicolás Maduro’, a top U.S. official said on Thursday”. It is not easy to guess – four days after the eruption in Venezuela – what the outcome would be. Whatever the result, which will not be a quick and stable one, the die is cast. Venezuela is not isolated from the past and recent history of ‘Latin’ America and from the global turmoil that ensued since the collapse of the Soviet Union and the end of the Cold War. Let’s outline first the recent history of ‘Latin’ America. I write ‘Latin’ in quotation marks to call your attention to the fact that South/Central America and Caribbean countries have been managed, since their creation during the 19th century until now, by those of European descent. That is, the ‘Latin’, who make up one of the three main demographic ethnic groups. The other two are Pueblos Originarios (First Nations) and the population of African descent. Hence, when looking at which countries are supporting the Acting President or opposing the elected President, it’s mainly an affair among ‘Latin’ Americans. Maduro’s dismissal of the Indigenous and Afro-descendants in Venezuela has been consistently denounced, although this was never the news in the mainstream media. The opposition is equally blind to the non-‘Latin’ constituency of the Venezuelan population. Secondly, the presence of the US in Central America goes back to the creation of the United Fruit Company in 1899. Politically (and also related to economic interest), the US’s intervention in Central America and the Caribbean began in the mid-20th century, and it was intensified after the Cuban Revolution in 1959. But before then, democratic-oriented Jacobo Arbenz, president of Guatemala from 1951 to 1954, was deposed by a coup d’état allegedly organised by the CIA. Ten years later, in 1963, Juan Bosch was democratically elected President of the Dominican Republic, but lasted only a few months in office. He later wrote a short essay entitled Pentagonism: A Substitute for Imperialism (1964). Bosch was following suit to a series of essays published shortly before by Senator J. William Fulbright, under the title The Arrogance of Power (1966). Thirdly, to contextualise the current events in Venezuela, it should be remembered that the turn of the 21st century (2003 to 2011) was the period of former Brazilian president, Ignacio Lula da Silva, who was celebrated as the ‘turn to the left’. At that time, Néstor Kirchner in Argentina, Evo Morales in Bolivia, and Rafael Correa in Ecuador were generating great enthusiasm among the Left and a meditative silence within the Right. This has come back with a vengeance in the past two years: Mauricio Macri was elected in Argentina; the judicial coup against Dilma Rousseff brought Michel Tamer and then Jair Bolsonaro to power in Brazil. This is a movement that is becoming integrated into what Hungarian billionaire George Soros denounced, during the last World Economic Forum in Davos, as the danger that the open society is confronting. The Chinese government did not wait to respond, which is not entirely unrelated to the situation in Venezuela in the global concert. The planetary scenario has changed significantly in the past decade. The downfall of the World Trade Center and the financial crisis of the late 1990s were signs of something difficult to discern. In the subsequent years, China’s economic growth was supporting its more active role in international relations. Russia was recovering from the neoliberal effect that permeated the 1990s. The emergence of the BRICS association, as well as Russia and China’s consistent dissension in the Security Council, were signs of the upcoming multipolar world order. Since Hugo Chávez was elected President in 1998, and because of its vast oil resources, Venezuela became a political force compared to other countries in Latin America that were announcing a ‘turn to the left’, By the first decade of the 21st century it was clear that it was not a turn to the left, but the politics of de-Westernisation and multipolarity. If the Cold War was the confrontation between liberal capitalism and state communism, the emerging multipolar, international order is clearly – and globally – capitalist; but it was neither liberal nor neoliberal. It was not anti-Western either. Rather it was creatively initiating a politics of de-Westernisation. What created the conditions for multipolarity was, paradoxically, the appropriation of the technology of economic growth and accumulation, and the simultaneous rejection of liberalism and neoliberalism. Venezuela Under Chávez was not socialist because of his friendship with Fidel Castro. From its very inception, the Chávez government was capitalist, as were the governments of Lula da Silva in Brazil, Néstor Kirchner in Argentina, Rafael Correa in Ecuador, and Evo Morales in Bolivia. But none of them followed the liberal or neoliberal vision. The homogenisation of the planet was supporting the economy of growth and accumulation. That is, it was the Westernisation of the interstate and international world order. The emerging multipolar order has appropriated capitalism, but rejected liberalism and neoliberalism. That is, multipolarity is motivated by the politics of de-Westernisation. Generally misunderstood, the goal of de-Westernisation is not to supplant the existing liberal and neoliberal retention of unipolarity, but to reduce the concentration of power inherent in unipolarity, as well as to open up world politics with coexisting multipolarity. Multipolarity means neither political relativism nor a romantic and pacifist coexistence. Nationalist interests in a multipolar world order shall be negotiated through dialogue not through war. It means that the political vision of the governing elites can no longer be unilaterally decided upon, as it is insufficient in satisfying the wellbeing of 8 billion people without sacrificing planetary living conditions. Venezuela today, and Syria in the recent past, are signposts of the conflict between the foreign politics of the US and the EU to re-Westernise the planet and the impossibility of doing so because of the forces of multipolar de-Westernisation. “It is increasingly clear that the only way to preserve peace and overcome the institutional political crisis, and to address the economic and social emergency, is dialogue and responsible negotiation, between the National Assembly and the Government, based on the premise of a binding consultative referendum so that the people can decide whether or not to re-legitimise all the powers, based on what is established in articles 70 and 71 of the Constitution. Mexico, Uruguay, and the Secretary General of the UN have proposed this initiative that has been accepted by President Maduro. This dialogue should contemplate the end to the parallel state, full guarantees that allow the realisation, in the very short term, of transparent elections, rejection of foreign intervention, economic emergency plan and national recovery, international cooperation to address the humanitarian emergency, law of amnesty, public and citizen audit of the debt and public management, and cessation of international economic sanctions” (translation by author). Venezuela’s domestic issues are caught in the spider web of the emerging interstate multipolarity. As the Citizen Platform rightly suggests, there is the international economic, political, and military pressure exerted by the US and its allies to reaffirm their dominance and geopolitical interests, while at the same time, Chinese and Russian investments in Venezuela and the surrounding regions have been rising. 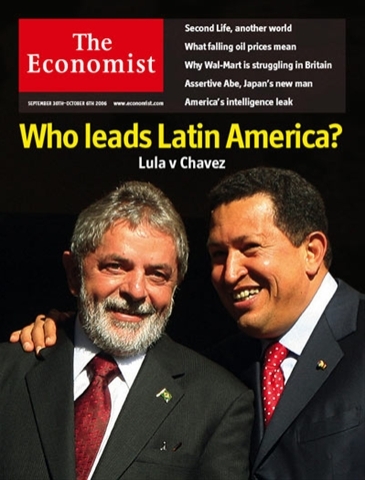 A cover of The Economist from 2006, is emblematic of the mood at the time.